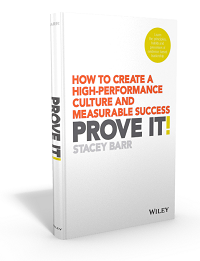 Many people are on a quest to find the perfect performance measures or KPIs. They’ll search KPI databases for the measures that get 5-star ratings. They’ll hire consultants to benchmark the best KPIs in their industry. They’ll commission universities to conduct research to craft special KPIs for their seemingly immeasurable performance outcomes. Buy-in matters more than the perfect KPI. If you search high and low and up hill and down dale and finally arrive at what you think are the perfect KPIs for your team or goals or organisation, I’ll bet there will be a group of people who don’t agree. They’ll argue about lack of data availability, or that it doesn’t measure what they can control, or that it’s not appropriate to their unique situation. 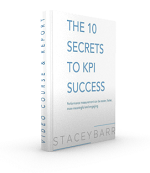 There won’t be enough buy-in to make the perfect KPIs work. But if you have that same group of people collaborate to choose a few reasonably good KPIs that they feel confident in (and this IS possible with a good KPI design framework), you’ll be better off because those people will use the KPIs. And when a KPI is used is just about the only time it can add value to the organisation or business. As time goes by, these people will use the KPIs to make at least some improvements in organisational performance. But they’ll also get better in their ability to choose better KPIs. Most of us learn best through experience than by being told. It’s much harder to get better buy-in for existing KPIs than it is to get better KPIs when you have existing buy-in. Where you’re currently struggling to find the perfect KPIs, stop and think for a moment… Is there a proxy or temporary KPI or performance measure that would give you enough information to get people focused and engaged on improving performance sooner (and finding better KPIs later)?